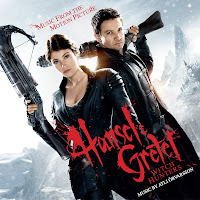 La-La Land Records and Paramount Pictures present the original motion picture score to the big-screen fantasy-horror-actioner HANSEL & GRETEL: WITCH HUNTERS, starring Jeremy Renner, Gemma Arterton and Famke Janssen, and directed by Tommy Wirkola. Composer Atli Orvarsson (SEASON OF THE WITCH, THE EAGLE, CHICAGO FIRE) unleashes a thunderous gothic score that propels all the film's action, chills and laughs in wildly entertaining fashion. Produced by Atli Orvarsson and mastered by Patricia Fourstar Sullivan at Bernie Grundman Mastering, this CD release contains a bonus track not available on the digital download version. 5/5 I am a fan of this type of film, which makes my love for the score one of those scores I must have in my collection. From cover to cover, track to track... and Gemma, they had me at "Hello". I have yet to see this film and when I do it's just going to be a good time. I am capturing the images while I listen to Atli Örvarsson interpretations and I am pleased by the level of being a great score!